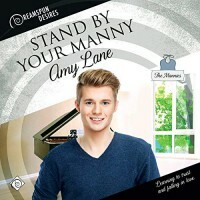 'Stand by your Manny' is the third book in Amy Lanes 'Mannies' series and while I listened to the first book on audio, I unfortunately took a pass on the second book and I honestly wish I hadn't. I was ok with this one because having listened to the first book on audio I was familiar with Sammy, one of the MCs, Sammy's Uncle Channing and Channing's partner, Tino. Since Channing and Tino are the MCs from 'The Virgin Manny' the first book in this series and Sammy is or was the seven year old in that story. Now, where things fall short for me is that some of the other secondary characters are from 'Manny Get Your Guy', the second book in this series. So needless to say I was a little bit 'who? what? where?' when it came to this part of the story and while it didn't make it hard for me to follow the story it was a bit distracting and I actually found myself going back and reading the blurb for the second book to try and give myself a better perspective of how these characters connected to the others and it did help a little bit. But while I wouldn't say that reading the first 2 books is necessary, I would definitely say that it would have made the reading experience better. So all things considered while 3.5 stars isn't quite my usual rating for an Amy Lane book it's still pretty good and first chance I get I'm going after book 2 on audio and redoing the whole experience...because re-dos on Amy Lane books are such a hardship...NOT! So, as I mentioned before we first met Sammy 14 fictional years ago on the pages of 'The Virgin Manny' when he was a sweet little 7 year old and now he's 21 and basically the light of everyone's life. His family adores him and he's an incredibly gifted young man with so many hopes, dreams and plans...full of ambition and an illness that could keep those dreams from coming true. Cooper's had a very different life from Sammy and his dreams have consisted of having the basics in life...a place to life, food to eat, health insurance all the things that so many people take for granted and eventually to being able to provide those things to a sweet, young girl who like Cooper has fallen through the cracks of the foster care system and has come to be the beginnings of the family that Cooper's going to make for himself. Together Sammy and Cooper begin to make each other whole again...filling in the holes and missing pieces. Creating new hopes and dreams for themselves and for each other. It's not very often that I get to read a book where one of the MCs was a child from a previous story so this was actually a bit of a reading treat for me and it was nice to get a peek at the MCs from the first book so many years later. Plus there were some delightfully humorous moments in this one. Peter B. Brooke was the narrator for 'Stand By Your Manny' and in spite of the fact that he has 54 audio books to his credit this was in fact my first time listening to a book narrated by him and for me the jury's still out on this one. At times when I was listening to the book I found that things just weren't working for me but there were other times that the narration was going really well so, in all fairness to this narrator I went and checked out the audio samples on a few of those books. What I found was that for the most part his voices in the samples I listened to showed a varied range and there may have been more than a couple of them that are now on my audio TBL list (To Be Listened-to) so at the end of it all for me on this one the narration was ok but I definitely think there's strong potential and I'll be checking out a few books by this narrator...you know purely for research purposes, right? My recommendation on this one...best when read/listened to in order, after enjoying 'The Manny Virgin' and 'Manny Get You Guy'...not required but strongly encouraged. An audio book of 'Stand By Your Manny' was graciously provided by the publisher in exchange for an honest review.